All Lincoln City homes currently listed for sale in Lincoln City as of 04/22/2019 are shown below. You can change the search criteria at any time by pressing the 'Change Search' button below. If you have any questions or you would like more information about any Lincoln City homes for sale or other Lincoln City real estate, please contact us and one of our knowledgeable Lincoln City REALTORS® would be pleased to assist you. "Sweeping ocean front views from 85' of frontage! This lrg, craftsman style home built in 2001 has extensive detail to finishes throughout. Spacious floor plan, scissor beam ceilings, lrg rock fireplace, wall of windows, lrg outdoor wind protected space and fully fenced lawn. Protective concrete sea wall. Beach access is adjacent to North end of fence, miles of sandy beach. Close to amenities! Owner open to trades,submit all offers." "OCEANFRONT COASTAL INSPIRED LUXURY HOME. Living is easy in this masterful designed home. Captivating ocean views to enjoy in the sprawling entertaining spaces that flow throughout this beautiful property inside and out. TURNKEY home with exquisite design. If you are looking for a very special home with panoramic views from almost every room this is the one. You will love the craftsmanship and miles of sandy beach to explore!" "An entertainer's showplace, this oasis of modern luxury brings laid-back elegance to indoor/outdoor living along with chic comfort, unsurpassed quality & top-drawer accouterments throughout. The well-planned interior of this custom coastal inspired residence captures epic ocean views & memorable sunsets from most rooms. Currently an exceptionally lucrative vacation rental. Be sure to watch the Matterport tour & aerial video." "Lakefront family home with huge deck overlooking the lake, on over a half acre! This 4500+ SqFt, 6 bedroom/4 bathroom home has lake views from almost every room! Two kitchen/dining areas, two family gathering areas, beautiful hardwood flooring, granite counters, custom cabinets, tile, vaulted ceilings and an over sized, attached 2 car garage. Wood burning fireplaces, a large boat dock and approximately 700 SqFt of unfinished storage." "Panoramic ocean views with 90' of frontage! Single level, great NW Lincoln City location for this 3,100 + SqFt home with 4 bedrooms/4.5 bathrooms. Completely remodeled in 2002 which includes high end laminate flooring and carpet throughout, updated kitchen and bathrooms, and a large wall of windows. Adjacent to easy beach access and miles of sandy beach! Short distance to dining, entertainment." "Originally sold as a luxury fractional vacation home & now offered in its entirety. Fabulously furnished & turnkey. Solid, custom, built for the coast, OCEAN FRONT. Staggering 180 degree views to see surfers, whales & the changing open sea. Private beach retreat exudes casual elegance in every detail & offers a resort inspired lifestyle. Upgrades, attention to detail readily apparent. Located on a quiet ocean front loop & off main rd." "Spacious and elegant Oceanview home in the private, gated community of Lincoln Shore Star Resort. This custom luxury home with an elevator features spectacular Ocean Views and meticulously thought out spaces to enjoy and entertain. From the entry level 1,000 sq.ft Entertainment Room w/wet bar, bedroom, full bath and large foyer to the upper level main living enjoy Ocean Views from almost every room, including the gourmet kitchen!" "Stunning ocean front home in Roads End. Custom designed & features, floor to ceiling gas fireplace with Natural Stone, oak cabinets, tile counters, alarm system, power drapes, instant hot water, vertical grain cedar deck, courtyard with pond, beach flood light & more. Too many features to list! Easy to show. Seller may consider selling with furnishings. Turn-key & move in ready!" "Sit back, relax and take in the panoramic ocean view from this fully remodeled oceanfront home. 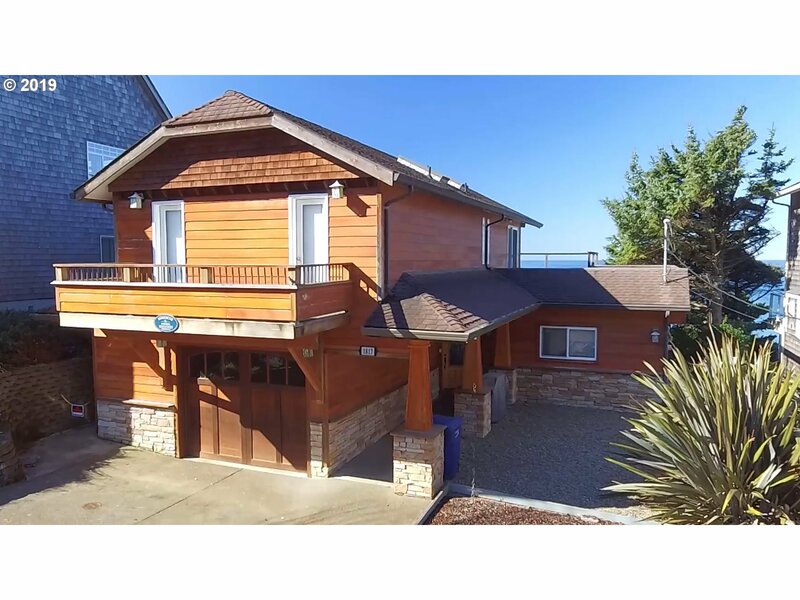 With 75' of ocean frontage this 2,716 SF home consists of 2 levels and features 4 beds/3 baths. An open concept kitchen, living room and dining area and windows throughout to maximize the view. Spacious master bedroom en suite w/large walk in closet. Additional 2 bedrooms/1 bathroom on the main level, a large great room and the 4th bedroom." "Classic beach home overlooking the amazing Pacific Ocean and miles of sandy beach! 75' of low beach frontage, protected w/concrete blocks and rip-rap. This 3 bedroom/2.5 bathroom, plus bonus area upstairs (approx. 468 SF) is currently being used as a 3rd bedroom. Right next door to beach access! Just a short drive to shopping, beach access, golf course, casino and restaurants. This is only the 2nd time that this home has been on market!" "Gorgeous Craftsman Ocean View New construction in Roads End only minutes from the Ocean beaches and State Park. 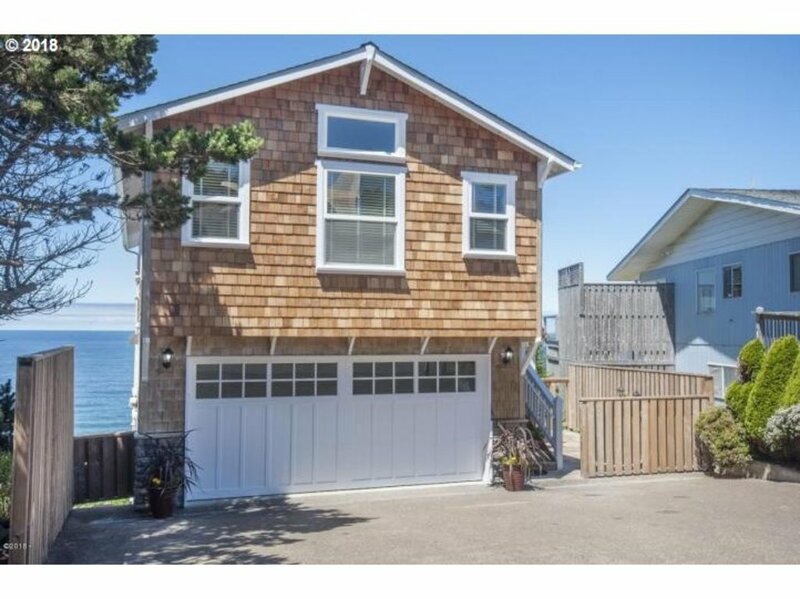 Located at the top in Belhaven supporting excellent Cascade Head Ocean views. Quality, high end finishes and details representative of Belhaven Homes. 4 bedroom en-suites with bath, open living kitchen desirable entertainment open floor plan. Extra storage attached garage. Directly located for ease to shopping, casino, beach." "Malibu Beach home on the Oregon Coast! Lux, custom OCEAN FRONT has vistas 2nd to none of sand, surf & sunsets. Watch big wave surfers slice it up at world famous surf spot, Nelscott Reef. You will love the laid back, beachy feel. Superior craftsmanship:Gorgeous custom cabinets, fine woodwrk, custom tilewrk. Great room & upper level family room open to oceanfront decks. 2 mstr suites w/insanely gorgeous spa bathrooms. Beach down the road"
"Fisherman dream home! 2005 built home with state of the art river front dock. Expansive river front patio ideal for entertaining guests after a day crabbing and fishing in the river. Vaulted living room features gas fireplace. Kitchen enjoys granite counters. Main level master bedroom includes spectacular 4 poster bed. Upper level features larger river view family room with closet for a potential 5th bedroom." "Artisan craftsmanship & layers of high end finishes. Gorgeous custom ocean view home. Step into the great room with soaring 25' ceiling supported by hand hewn beams. Banks of glass extend from new hardwood floors to the ceiling. Gourmet kitchen:New SS appliances & custom handcrafted butcherblock counters. Perfect for casual dining! master suite with ocean view sitting area, private deck & spa inspired bathroom. 2018 50 yr roof installed"
"This plan hits all the buttons! Gracious open floor plan to enjoy the ocean view! Large Kitchen island with your choice of granite or quartz. 3 en-suites + media room. Wrap around decking to better enjoy the ocean air! Long list of standard interior selections & optional upgrades to choose from. This home is being started as a spec & framing to happen soon! Olivia Beach is an ideal second home and vacation neighborhood." 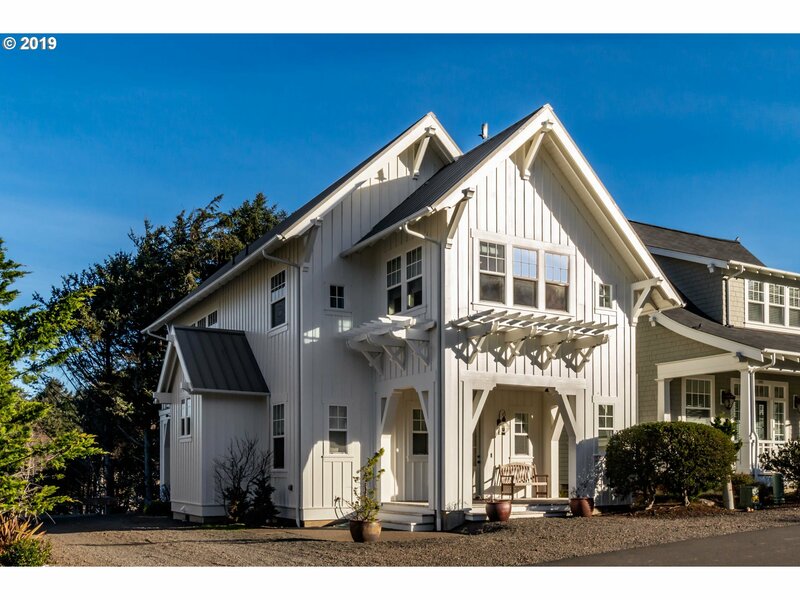 "Nearly a historical landmark, this oceanfront cottage built in 1930 is in the heart of Oceanlake. Enjoy a 180 degree view of the Pacific Ocean. This unique and charming cottage provides a tranquil and private setting, while just a few blocks from multiple beach access points. Numerous recent improvements, e.g. updated plumbing, new shutters and paint and new water heater. Abundant wildlife viewing of migrating whales, Brown Pelicans..."
"50' of OCEAN FRONTAGE! This 2,639 SF Oceanfront home is the lowest priced per square foot on the market and overlooks the popular world class surfing destination at Nelscott Reef. Most of the home is single level living. Home features 3 bedrooms/ 2.5 bathrooms with living room, family room, sun room, 2 fireplaces, vaulted ceilings, stainless appliances, deck and spacious patio. Close to beach access, shopping, dining and entertainment." 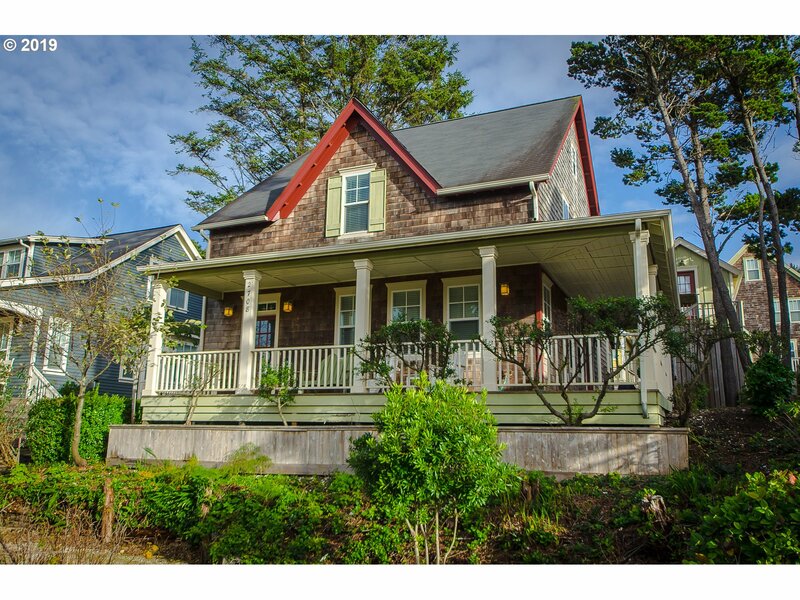 "Popular ocean view vacation rental in the desirable area of NW Lincoln City. This home built in 2007 is 2,736 SF with 4 bedrooms/4.5 bathrooms. Located a just a couple blocks away from miles of sandy beaches. Close to shopping, dining and the casino. Buyer to honor all vacation rental bookings. More photos coming soon!" "OPEN HOUSE on Saturday, Feb 2. - This elegantly appointed home is finely furnished for turn-key living. Set on the Central Park, the heartbeat of the neighborhood and a stone's throw to the beach boardwalk. Located in the traditionally designed neighborhood of Olivia Beach offering Vacation Rentals and Second Homes. The only VR Zone in Lincoln City." 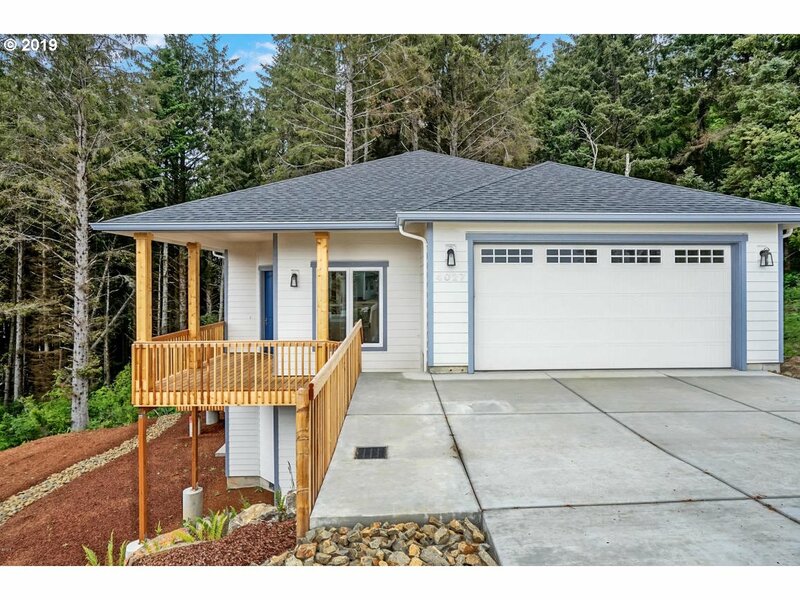 "Under Construction in the Resort at Bayview on the Oregon Coast is this spacious 4 bedroom, 2.5 bathroom oceanview home. Open great room features gas fireplace with ocean and forest views! Master bedroom and laundry/mud room are located on the main level. Downstairs is ideal for family or guests with the family room and bedrooms. Located in Lincoln City, the Resort at Bayview sits above the Siletz Bay and the Pacific Ocean." "Overlooking the neighborhood with the Pacific Ocean as the back drop, sits this to-be-built home. Easy build process beginning with approving the details of the floor plan & choosing from an extensive list of standard options & optional upgrades. A detached, single car garage is optional. VR Zone with beach access, parks and swimming pool!" "Expansive oceanfront views up and down the beach from huge picture windows. Open floor plan with large living room includes 2 fireplaces.Light and bright interior. Upper living room has natural stone accents. Dining room offers great oceanfront views and deck. New GE appliances except washer/dryer. New carpeting throughout. New kitchen entry flooring. Rebuilt deck. Newly painted interior and Exterior." "Enjoy lake front living in this well maintained 3 bed/2.5 bath home. Panoramic lake views overlooking the large central bay of Devils Lake. Boat house with ramp and wench, includes 1995 Four Winds 19ft. inboard bow rider. Open plan with fireplace in living room and a wall of windows to enjoy the view. Dining room is located in a sunroom off the kitchen with access to a lake front deck." 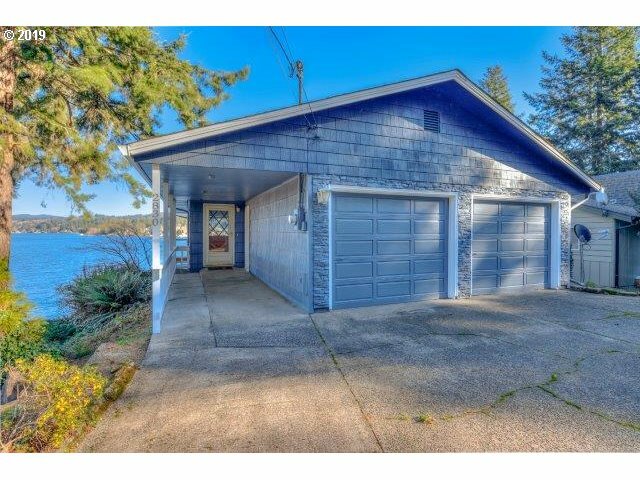 "Ingeniously well organized Ocean view home for easy care comfortable living! Exceptional thought was planned into this homes architecture. Beautiful living spaces enhanced with window seats, libraries, gaming tables, french doors opening to ocean view patios or private sunrise sunset hideaways. Classic good taste old world modern, hard wood floors, white tile baths, luxury working open kitchen, dining living to open deck ocean views. Ma"